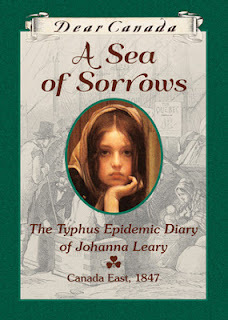 Description: In the midst of the Irish famine, Johanna flees one disaster — only to land in another. After a massive potato famine strikes Ireland, thirteen-year-old Johanna Leary flees to Canada with her family. But typhus and other illnesses plague the "coffin ships," so named for the staggering number of immigrants who died enroute. One by one Johanna loses the members of her family — first her baby brother on the journey over, then her mother in the Grosse Isle fever sheds where sick passengers are quarantined when they reach the port of Québec, and her father soon after. Johanna has only her brother Michael left when she sets foot on Canadian soil. When her brother is mistakenly told that she too has died, he sets off to find their uncle "somewhere in Canada," leaving Johanna to face a new life in a strange land... totally alone. "Just thinking about sizzling sausage makes my mouth water, even though I have never eaten it. Sizzling is such a fine word. I think anything that sizzles must taste delicious." "I knew for myself that the sheds were filled with many decent people who had never needed any charity until they were forced to watch their loved ones dies of hunger." "Da had always supposed that everything would be different across the ocean. But I am beginning to think that things are a misery for the least fortunate no matter where they may find themselves." I got this one too, but my sensitive daughter may not want to read this one with me. I think I will also be bawling as I read it.